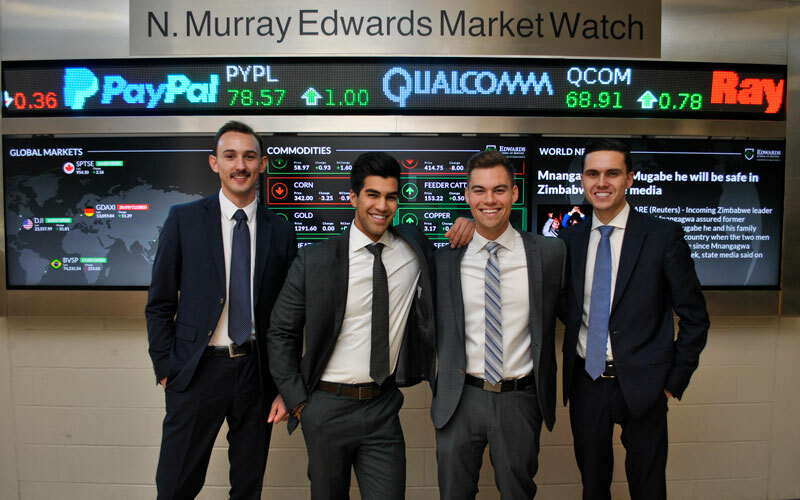 A team of four Edwards students and members of the USask Investment Club are in Toronto this week for the National Investment Banking Competition (NIBC) and conference. This year’s team consists of four talented individuals; Evan Rhode, Jonathan Skwarchuk, Michael Miller, and Ruben Esterhuizen. NIBC brings together the brightest students from over 100 universities across the globe and 150 professionals in an annual case competition and conference. Competitors are given the resources to develop and showcase their skills in financial analysis, modeling, and pitching, which are essential for careers in investment banking. Case structure, models, and templates are conceptualized by senior investment banking professionals based on fully authentic transaction scenarios. The student team competed in a preliminary round in October, producing a Corporate Valuation & Strategic Review in a three-week timeframe. This involved conducting in-depth financial analysis and modeling of a target company, with the goal of providing strategic direction for the company within the framework of a professional recommendation to its board of directors. Tasks included research and analysis of historical and forecasted financial data, scenario analysis, pitch book creation, and presentation to senior managers of notable global investment banks. The hard work and preparation over the last six months did not go unnoticed and the Edwards team was selected to compete in the finalist round. They are one of 32 teams among 300+ initial applicants who were awarded this final round opportunity. In conjunction with the final round of the competition, NIBC organizes a series of workshops, panels, and presentations on investment banking and private equity deals by distinguished industry leaders. The event culminates with the gala dinner where the top four teams pitch their transaction recommendations to a managing director panel. The evening will feature a keynote from Entertainment One’s CEO, Darren Throop. Congratulations and good luck to our Edwards students!